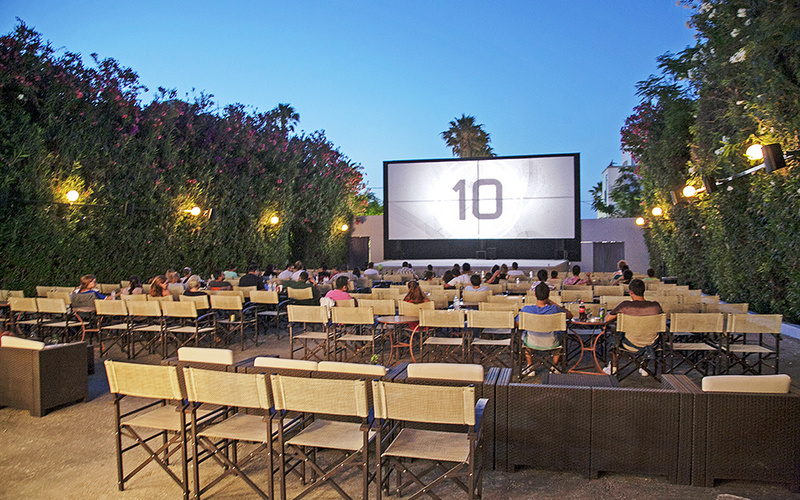 Open-air cinemas are a quintessential Greek summer delight. 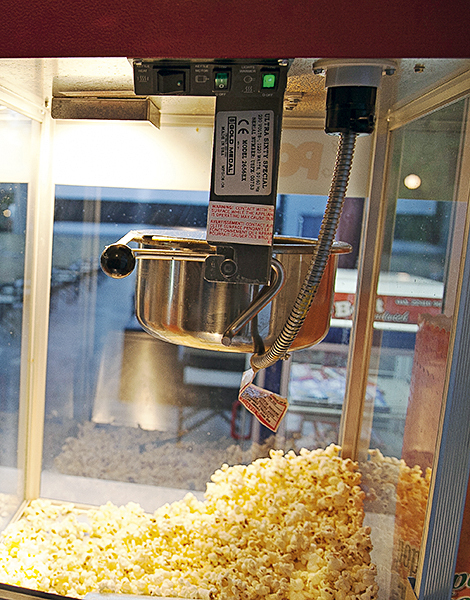 Where better but the islands to enjoy a Hollywood classic or the latest blockbuster under the stars? You’d think that the strong smell of jasmine and the noisy songs of the cicadas – both heralding the start of yet another Greek summer – would distract you from silver-screen magic at an open-air cinema. 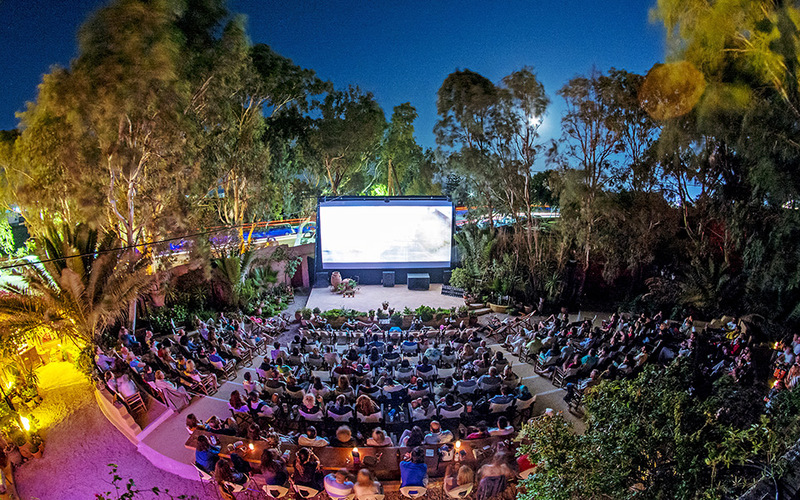 On the contrary, the allure of catching a movie under a moonlit canopy – buttered popcorn and drinks at hand – is so potent that people are willing to forego Dolby surround systems and other technology. 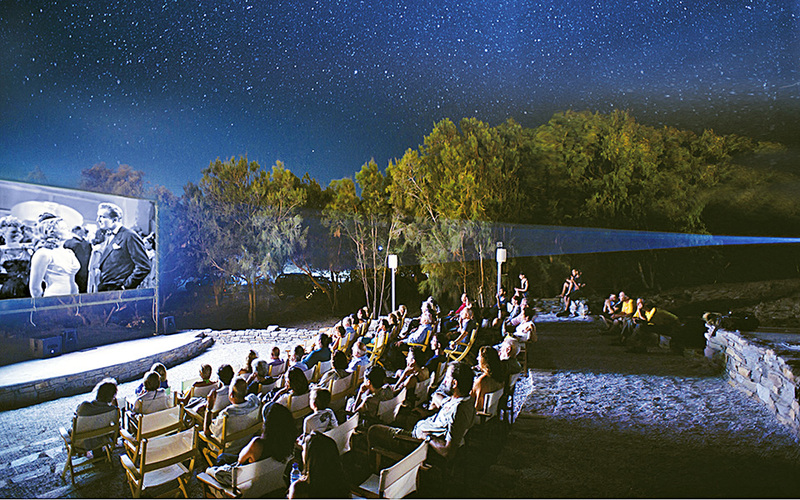 Kick off your shoes, let the sand sift through your toes and the salty sea mist envelope you, while enjoying a retro cinema flick by the sea at Cine Enastron – part of the protected 80-hectare Paros Park that covers a network of walking trails, impressive rock formations, caves and hidden coves. The beach also has a cafe and watersports facilities, for daytime fun. The cinema begins playing films at 21:30 in English, with Greek subtitles. An eden-like garden is made all the more dreamy by the waft of burning incense. Cats meander through the aisles, hoping to catch a morsel of food, while most movie-goers head for the well-stocked bar that serves a number of divine cocktails as well as local Santorini wines. Free blankets are offered on chilly nights, making the outdoor experience all the more cozy. The venue, which opened in 1987, also hosts concerts, plays, and art exhibitions. Movies are in English with Greek subtitles and kick off at 21:30. Doors open at 20:30. Cine Kamari is at the scenic coastal village of Kamari at the southeastern part of Santorini • Tel. (+30) 2286.033.452 • Admission at 8 euros. It doesn’t matter how many times you’ve watched the hit musical “Mamma Mia!”; you’re missing out if you don’t watch it here. For the past eight years, the movie has been screened every Monday and Thursday to cash in on the fame of the huge hit, which was filmed on a location at Skopelos and the surrounding islands. “Mamma Mia nights” have a cult following, with regulars and wedding parties attending dressed the part. The staff entertains the crowd with Greek traditional dancing during intermission, and all this culminates in one huge Abba party after the end of the film. The cinema, created in 1961, has a retro look, and plays recent releases in English with Greek subtitles on other nights. Screenings begin at 21:30. Attikon Cinema is at Papadiamantis Street, Skiathos Town.• Tel. (+30) 6972.706.305 • Admission 9 euros and 6 euros for kids. 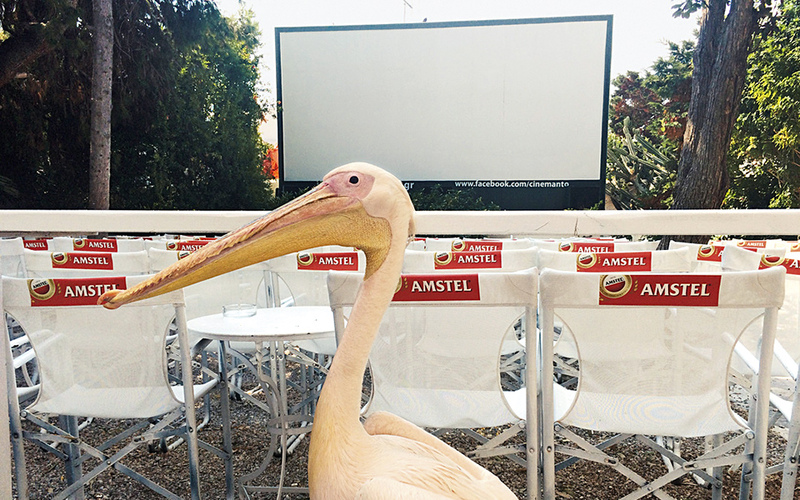 The outdoor Cine Pallas attests to the elegance of Syros. Built in 1855-1866, it was initially the municipal grocery store. It was converted to a summer cinema in 1951. Located at Miaouli Square, it offers exceptional views of the beautiful neoclassical buildings of Municipality of Ermoupolis and the Municipal Library, behind the cinema screen. Movies begin at 21:30. An oasis of serenity right in the middle of the municipal garden in the center of the main town, Chora. Lie in one of the hammocks under the towering pines, near the lily pond, where Petros the pelican (the mascot of Mykonos) likes to hang out. The restaurant here is worth a visit, too, as it offers superb dishes, and is open from 10:00 until 2:00 (after midnight). Films are screened at 21:00 and 23:00 in English, with Greek subtitles. Cine Manto is at Limni, Hora, Mykonos • Tel. (+30) 2289.026.165 • Tickets are at 9 euros for adults and 7 euros for children. The cinema first opened in 1958, and it still retains many of its original elements – so much so that it might feel like you’re stepping into a time warp. Welcome to the late 50s, where vines and fuchsia bougainvilleas cling to the side walls, emitting fanciful aromas. The yellow director’s chairs are comfortably spread around tables where you can lean in to eat your pizza and hot dogs. Movies start at 21:00. Orfeas Cinema is at Fenaretis 3, Eleftherias Square, Kos.• Tel. (+30) 2242.049.748 • Tickets are at 7 euros, and 5 euros for children under 12. 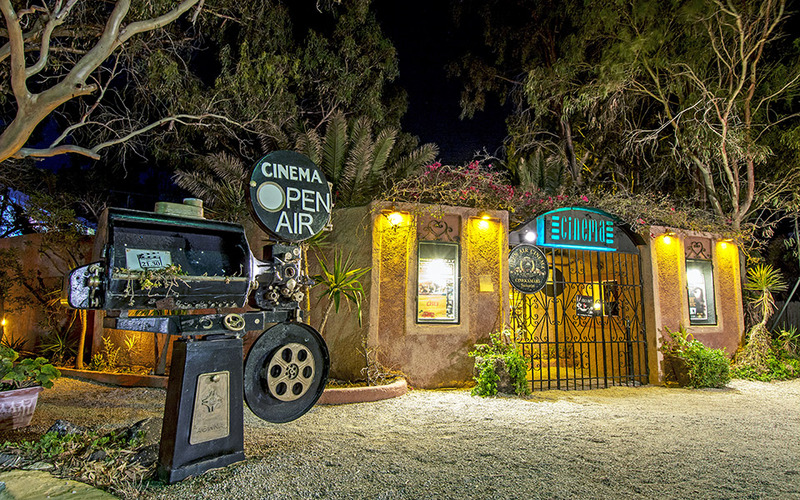 This family-run cinema is located amidst lemon groves, basil plants and the verdant forest landscape of the picturesque village of Mytilinii – a well-kept secret veering off the tourist trail. Guests place their dinner orders before the movie starts, and receive pizza, souvlaki and drinks at their table, during the screening. At the end, the owners treat guests with free loukoumades (small fried dough balls dipped in honey and drizzled with sesame, walnuts and cinnamon). 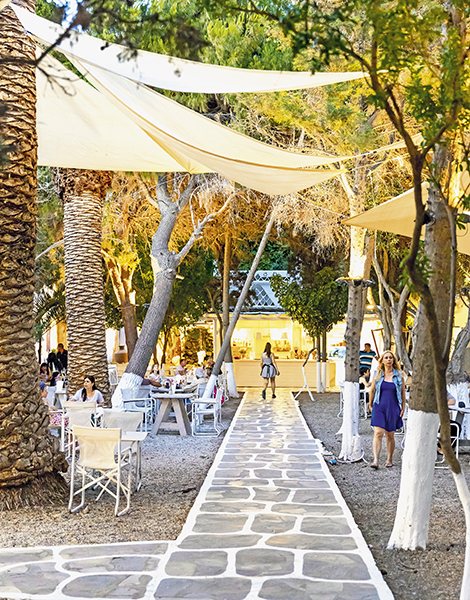 An added plus is that this village is one of the coolest places on the island – a godsend on those hot, steamy summer nights. Movies kick off at 21:00 and are in English with Greek subtitles. Cine Rex is located at Mytilinii, 10km south of the island’s capital, Vathy. • Tel. (+30) 2273.051.236 • Tickets at 7 euros for adults and 5 euros for children. The municipal garden of Hania, created by Reuf Pasha in 1870, is a remnant of the Ottoman occupation of the island. The open-air cinema, Kipos (meaning ‘garden’) is an extension of the park area. In the shade of evergreens, screenings start early: one at 19:00, and one at 21:00. The Roloi (Clock Tower), right beside the screen, gives a dramatic feel to the whole experience. Nearby, the traditional Kipos Cafe, built in 1905, adds an extra touch of elegance to the place. Few cities can brag about being endowed with an open-air cinema within the confines of a Venetian monument. But the old walls of the city are just one of the reasons this venue, which opened in 2007, is worth visiting. Other reasons include the careful selection of the movies themselves – hand-picked by the Cinema Club of Irakleio – and the cheap tickets at three euros per person (1 euro for children). The owners of Cine Diana cast their initial focus, in 1950, on the indoor movie theater, and added an open-air terrace for summer nights. As years went by, the terrace became the main act, and Cine Diana became a classic destination for those warm, starry nights. Most viewers buy their souvlaki at a corner joint nearby, and enjoy two screenings – one at 21:00 and one at 23:15 – with chilled beer from the cinema’s bar. And that’s as good as it gets!